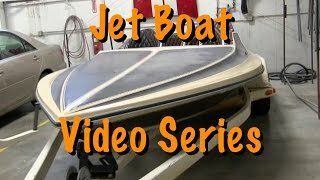 In this video series we are going to be rebuilding classic 1978 Condor jet boat. The boat is not in too bad of shape, but is going to require some fiberglass work, body and paint, mechanical, and interior work to get it back on the lake. Crows feet, AKA cracking, or checking is when a cured paint finish has many cracks of different lengths and depths. This can be caused by a number of things: paint coatings too thick, excessive UV rays on the paint surface, not enough hardener or improper mixing when mixing the coatings, or insufficient flash times between coatings when sprayed on. On the just boat the coatings were thick and years of the sun beaming down on the surface caused the problem. How to Repair Crows Feet Unfortunately, repairing crows feet is not a simple fix. Especially if the crack are deep into the paint finish. So to properly repair this, the surface must be sanded down past the cracks. I have heard of people sanding the surface and spraying primer surfacer over the top to fill the cracks and then block sanding the surface level. However, this leaves a chance of the primer eventually shrinking and the cracks reappearing after the surface has been painted. So if you’re wanting to do it right, you need to partial strip the paint surface to completely remove the crows feet. The cracking in the jet boat for example was deep going all of the way through the gel coat. And with the years of sun baking the coatings made it feel like sanding concrete. I started out with 180 grit on an 8 inch sander, but discovered that was not going to work. Then I switched to 80 grit and will probably switch to 36 grit to get this coatings stripped off. Sanding with 36 grit is going to require that I go back over the surface with 80 to minimize the 36 grit scratches, then going over the surface again with 180 to minimize the 80 grit scratches. Then once I have the surface sanded with 180 I can apply primer surfacer. So to do this right there is no easy way….partial strip the paint surface to remove all cracks is the only certain method to assure they will not return. Note: I would always try to start out with 180 grit to see if that removes the scratches easily. 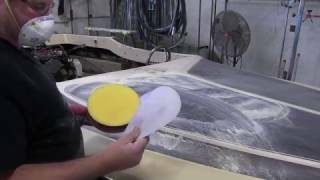 This will save time of switching to the different grits of sandpaper. Interior We also started removing the interior on the jet boat. The front seats were easy, but we ran into a snag when removing the rear seat. Working on old projects is like Forrest Gump and his chocolate….you never know what you’re gonna get. But, I guess if everything worked out perfect the way it was supposed to all the time we’d not have the challenge that keeps us up at night trying to figure it out. You can see the challenge I faced in the video….and maybe I should have slept on it. But I was in one of those get r done modes.